Being a collection of ten essays by academics, specialists in their particular periods, this new history of Scotland from the time of the occupation by the Romans to the reconvening of the Scottish Parliament in 1999 is far from a sleep-inducing tome that celebrates uncritically our country’s glorious achievements (‘wha’s like us!’) or bemoans blow by blow by blow its shameful story (‘they’ve took oor ba’, it’s no’ fair!’). These insightful essays are a highly readable and accessible set of discussions that bring a new dimension of understanding to the Scottish past. They are also, by their nature, studies on the matter of identity. As such, they are to be welcomed. The approach to history-writing adopted in this collection sets new standards in the communication of history for the general reading public. Given their relative brevity, the essays may risk being seen as no more than sketches; rather they are concisely written and are in no way sketchy. As a result, a broad sweep is taken, but that approach works well here. Each writer discusses the prevailing social, political, economic and cultural conditions of each period and synthesises these factors in their interpretation and assessment of the period under examination. The depressing time that followed the Union, particularly after 1746, is a period that many Scots have difficulties with. Richard B. Sher in his chapter, ‘Scotland Transformed: the eighteenth century’, offers perhaps more positive interpretations of those times than the usual, which may provide some comfort to those who never got over our being very hard done by. Sher writes that ‘perhaps the union’s most productive effect was to stimulate a new dynamic mind-set … a psychological drive to succeed rooted partly in traditional Scottish attitudes, partly in new opportunities. An enduring tradition of national self-doubt and uncertainty became a creative force, as Scots struggled to overcome real and imagined shortcomings by demonstrating their own worth to themselves and others.’ This was one of the paradoxes of eighteenth century Scotland: the Enlightenment, although with its roots in the intellectual tradition of the seventeenth century, can be seen as a ‘belated consequence’ of the Union. If only the English had greater awareness of the laws of unintended consequences, Scotland might never have been invited into the Union! David Armitage arrestingly opens his essay ‘The Scottish Diaspora’ with the mediaeval French proverb, ‘rats, lice and Scotsmen: you find them the whole world over.’ Notwithstanding the fact that Scots, surrounded by water on three sides, have always voyaged abroad, it is only in recent years that the socio-historic phenomenon of ‘diaspora’ has been the subject of serious critical study. Armitage reminds us that ‘Scotland’s history is a transnational history because the Scots have been such a prominently international people, with an estimated 25million people of Scottish descent living outside Scotland.’ Scottish migration and Scottish migrants are no less a part of Scottish history and ‘no history of Scotland could be complete without an account of the Scottish diaspora.’ Armitage’s chapter is rich in detail, and when discussing migration he does acknowledge that poverty and want caused Scots to migrate in large numbers in the late eighteenth and early nineteenth centuries, though he also offers other factors which have accounted for the ‘diasporic tendencies’ of the Scots from earlier times. Armitage makes an important distinction between ‘mobility’ and ‘migration’, the former clearly being through choice, the latter out of necessity, and stresses that not all forms of migration were permanent. On the question of ‘inward migration’, he points out that Scotland neither needed nor experienced any major inward migration before the coming of the Irish in the early nineteenth century, though I.G.C. Hutchison in ‘The Workshop of the Empire’ does give some consideration to Irish immigration. Making the Scottish past speak for itself quite literally, Sally Mapstone in ‘Scotland’s Stories’ considers some aspects of Scottish literary history, and those stories in which the ‘matter of Scotland’ is chronicled, particularly in Barbour’s Bruce and Blind Hary’s Wallace, in which kingship, nationhood and community are presented as noble and desirable things. These confidence-building chronicles – common across Europe during that period – were designed to inspire a sense of identity and indeed greatness (as such they can be seen as very early, though admittedly extended, examples of ‘vision statements’ and ‘positioned communication’, so much in vogue in the ‘corporate communications’ of today. They are certainly not ideologically dis-similar in purpose or function!) For me, this chapter is a literary diversion, in the best sense of the term. Richard Findlay’s essay ‘The Turbulent Century’ brings us up to date. It is remarkable that the old national proclivity or disposition towards doubts and uncertainties, so detrimental to well-being, whether personal or national, which had become so much less vigorous since the seventeenth century, should sadly become evident again in the twentieth. In some respects, a significant part of the twentieth century can be regarded as a low-point for Scotland, even without the horrors and devastation of two world wars. Social inequality, poverty, hunger, unemployment, decline in heavy industry, poor housing, poor health, sectarianism, the old social problems, the usual suspects. ‘It was impossible to underestimate the extent of the problems which faced Scottish society in the aftermath of the second war. War damage was added to the dismal catalogue of social problems that had been inherited from the 1930s.’ Many of these problems existed before the first world war and had not been addressed after 1918. It is little wonder that the ‘Governor-General’ of Scotland, Walter Elliott, should have written in a memorandum in 1936 that there was ‘a dissatisfaction in every book written on Scotland now for several years.’ Social reconstruction and social transformation post-1945 was painfully slow, but by the early 1960s the impact of the NHS, full employment and the consequent rising standards of living had brought massive improvements to the health of the nation. Findlay writes that, ‘the last twenty years of the twentieth century witnessed a degree of political, social, economic and cultural change in Scotland that has perhaps been unprecedented since the Industrial Revolution.’ Though Findlay is ready to add that during this period the wealth gap increased greatly, so leading to the creation of an underclass, and that multinationals, the ideology of the free market, the scourge of drugs, urban deprivation and increasingly global popular culture, all of which affect Scotland, are features common to most modern societies. Arguably that is the price we pay for living in what might be termed a liberal democracy. It was John Smith who articulated that devolution was the ‘settled will of the Scottish people’ and Donald Dewar who saw this into being. Our Parliament has been reconvened and history has taught us that we have to look to ourselves to make it work. 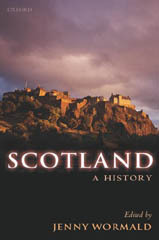 Scotland: A history is one of a number of recent Oxford University Press publications on Scottish history. This collection of essays – under the robust editorship of Dr Jenny Wormald, who contributes a chapter herself on the ‘godly society of seventeenth-century Scotland’ and demolishes some of the myths about that period – represents an important contribution to Scottish history studies and makes fascinating reading. It would, I believe, make rather a welcome gift for Scots to offer to their friends to celebrate St Andrew’s Day or to hansel in the new year of 2006.